This is certainly a restaurant with a view, on the 101st floor of the ICC building, Hong Kong's tallest structure (it has 118 floors). 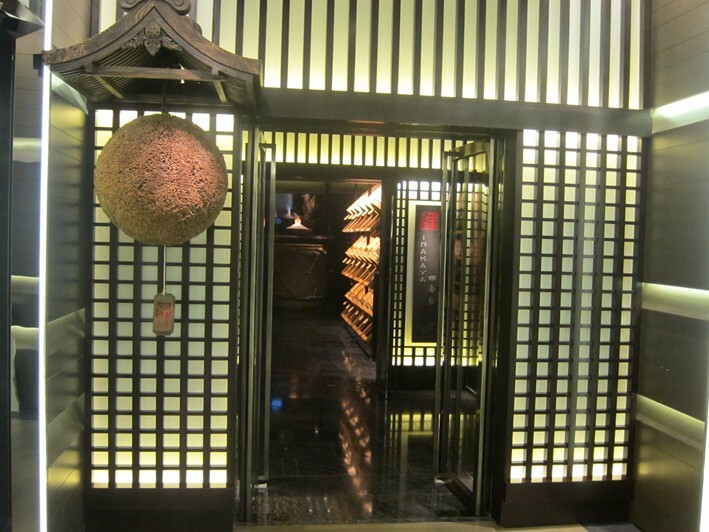 Ryugin opened in March 2012 and is the younger sibling of the superb Ryugin in Roppongi, where I have eaten some stunning dishes. 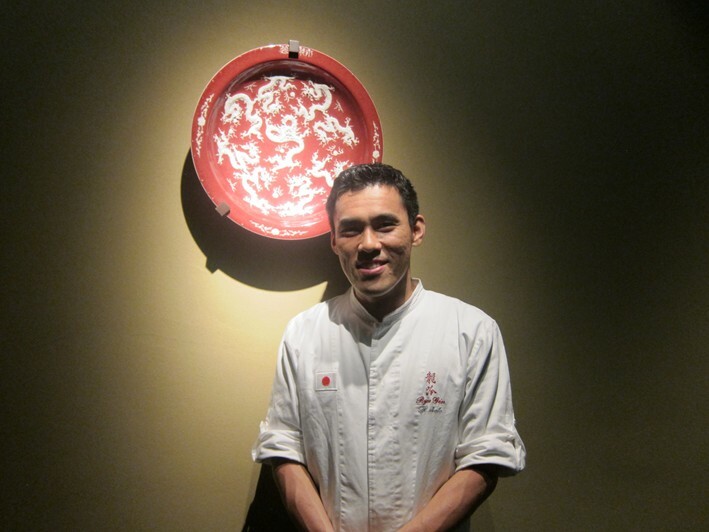 The head chef here is Hideaki Sato, who worked with chef/owner Seiji Yamamoto at Ryugin in Tokyo previously. 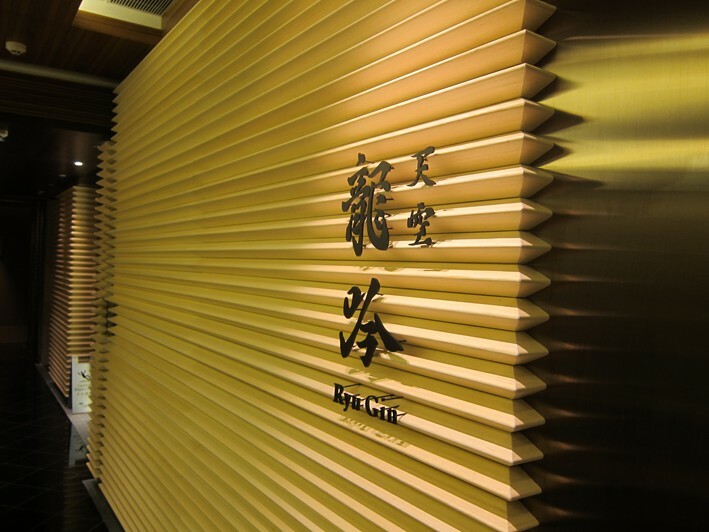 Five chefs have transferred here from the original Ryugin, and most ingredients are imported directly from Japan, a wise move given how crucial ingredient quality is to Japanese food. 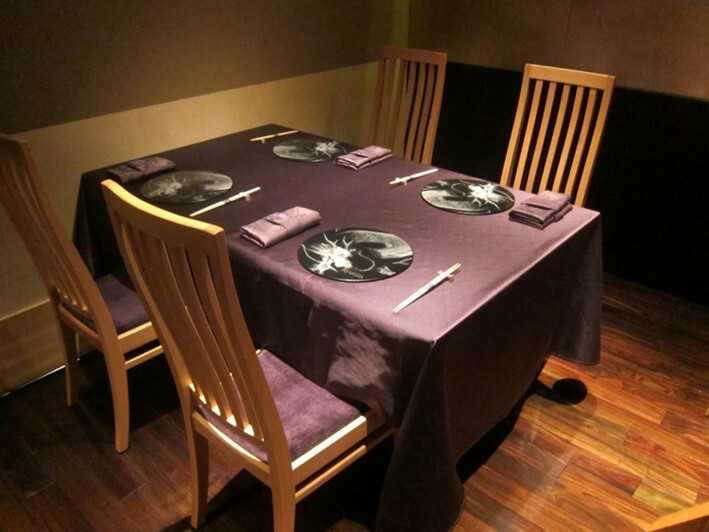 As in Tokyo, the format is a no-choice, ten course kaiseki menu, priced here at a chunky $1,980 (£156). The dining room, not surprisingly, has some striking views of the Hong Kong skyline from its lofty vantage point across the harbour in Kowloon. The dining room itself is quite simply decorated, with fairly low lighting. With a view like this you do not need much distraction, though it is worth noting that some of the plates used to serve the dishes were exquisitely pretty. There is a wine list, but it is excessively marked up. Leflaive Fourchaume Chablis was HK$880 for a wine that you can buy in the high street for HK$146, Etienne Sauzet Puligny Montrachet 2009 was HK$1,880 for a wine that retails at HK$462 and Ducru-Beaucaillou 1995 was HK$4.080 for a wine that will set you back HK$1,351 to buy in a shop. We drank beer. The meal began with corn custard jelly. This may not sound that promising, but the depth of the corn flavour that came through was remarkable, the richness of the custard delicious. It takes real talent to make such a mundane ingredient taste this good (19/20). 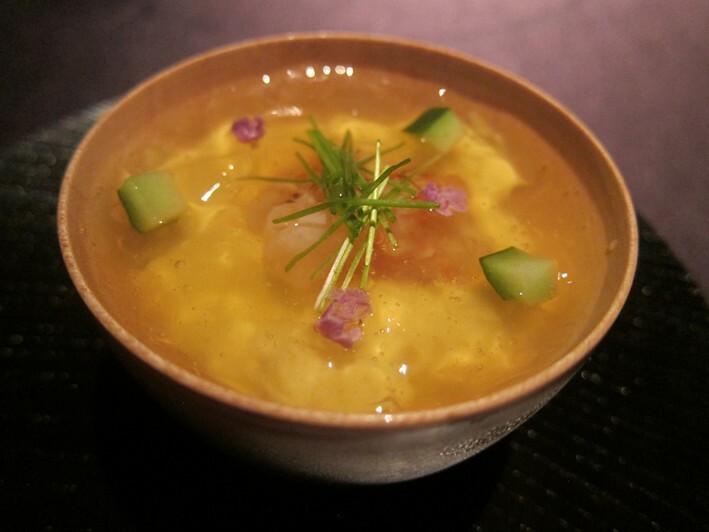 Sea urchin from Hokkaido was served with tempura of scallop with aubergine in a ginger broth. 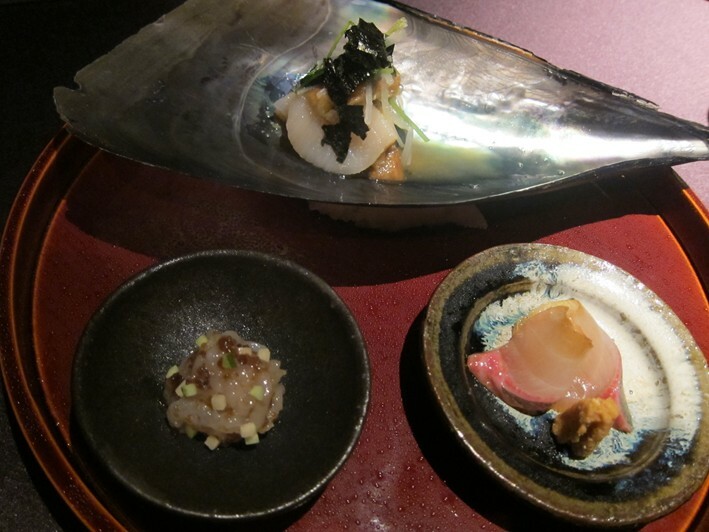 Hokkaido is famous for the quality of its seafood, even by high Japanese standards, and the scallops had lovely inherent sweetness, the tempura batter very light, the ginger flavour enhancing the dish but not overwhelming the scallop, while the excellent sea urchin added an element of richness (19/20). Abalone with octopus with apple jelly and aubergine was another impressive dish. Before I went to Japan I assumed that abalone (and octopus for that matter) was always chewy, but it can be lovely, as it was here. 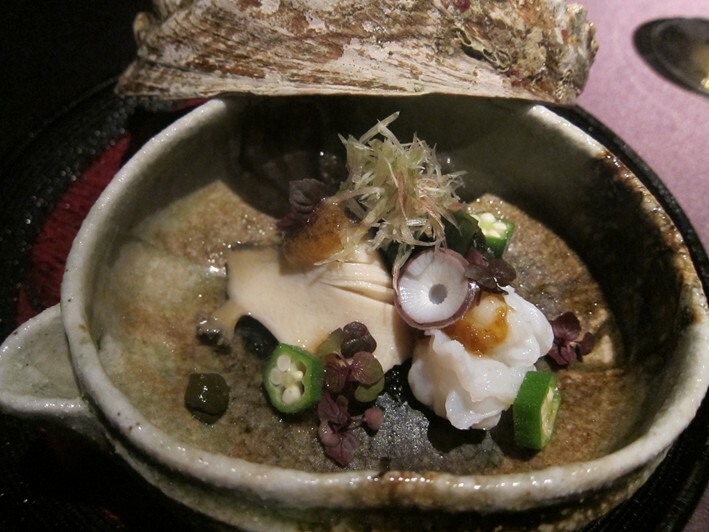 Ryugin slow-cooks the abalone for several hours to bring it to a giving texture, and the shellfish flavour was nicely balanced by the acidity from the apple jelly. The Japanese aubergine had remarkable taste, a world away from the humble product that we have been accustomed to in our supermarkets (19/20). 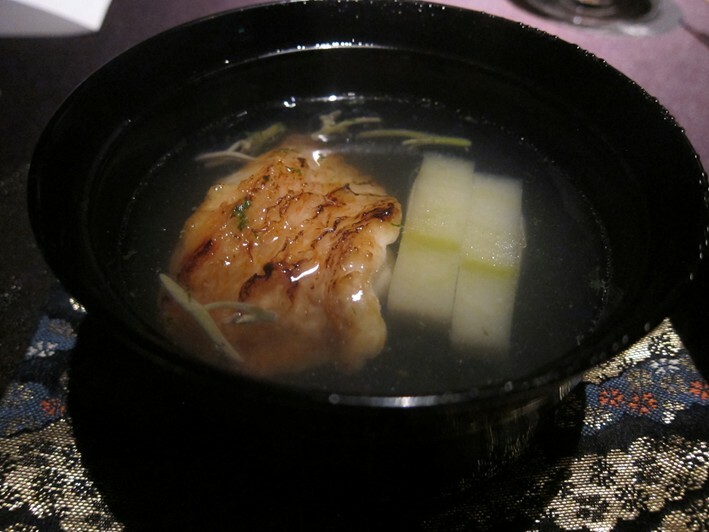 A fish called kinki (a rockfish from Hokkaido reminiscent of snapper) was grilled over Japanese charcoal and served in a herb broth; the flavour of the charcoal still lingered in the fish even though it was resting in liquid, and the fish itself was precisely timed; still, this dish lacked the excitement of the previous ones, very good though it was (17/20). Sashimi had three elements. Clam marinated with ponzu and smoked aubergine and served with seaweed was good, but personally I find there is a limit to how exciting a clam can taste. Much better to me was shimaji (striped jack) with ginger wasabi, the fish having lovely flavour whilst the ginger wasabi was a revelation. Even better was white shrimp marinated with balsamic vinegar, which had dazzling flavour (18/20 average). 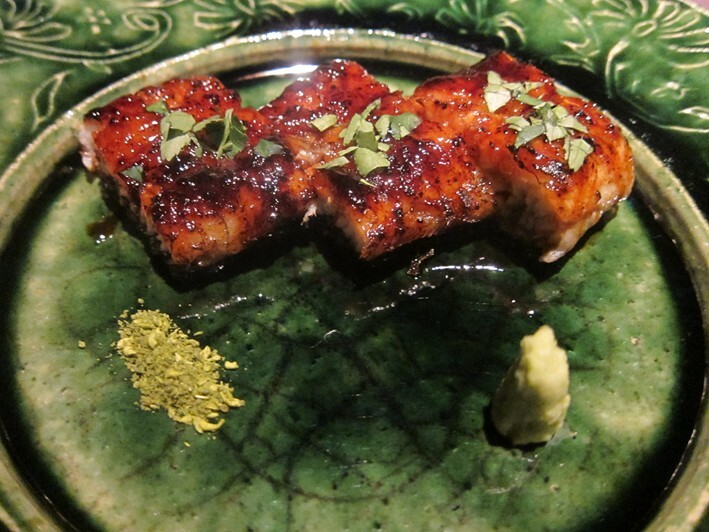 Next was a simple dish of eel grilled over charcoal with wasabi and Japanese pepper that had a citrus hint. The quality of this eel was extraordinary, coming in this case from a large 3.3lb eel, perfectly cooked, the eel retaining the smoky hint from the charcoal grill, the freshly grated wasabi creamy and spicy, the pepper just lifting the flavour. This was the best eel I have tasted (20/20). 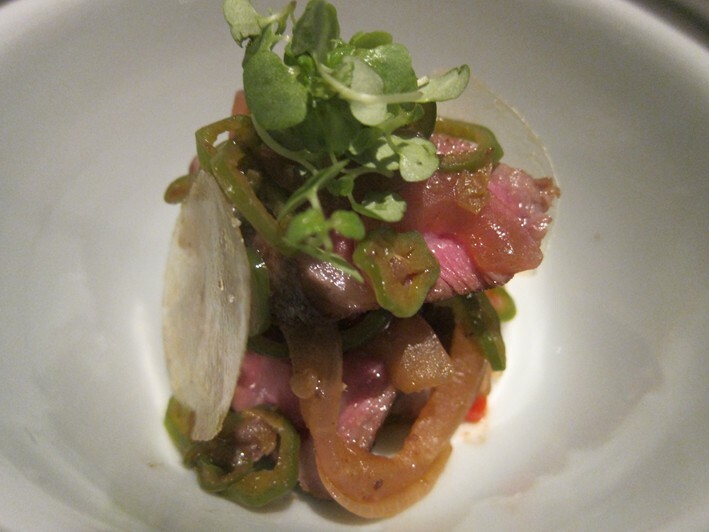 Next was wagyu beef from Saga prefecture in Kyushu (A3 grade) with red and green peppers from Kyoto and sandia pepper, with ultra-thin discs of potato. The beef was lovely, not from one of the most highly marbled grades, and I have found that I often prefer the more moderately marbled Japanese wagyu, as the ultra-marbled ones can be so buttery that it is easy to forget that you are eating beef. The discs of potato were a nice touch, extremely delicate, while the mild peppers were again of very high quality (19/20). At this point rice and pickles appeared, always signifying the end of the savoury stage of a kaiseki meal. Often in Japan you just get a bowl of plain rice, but here the rice was served with delicate crab from Hokkaido to make it more interesting. There were two desserts. 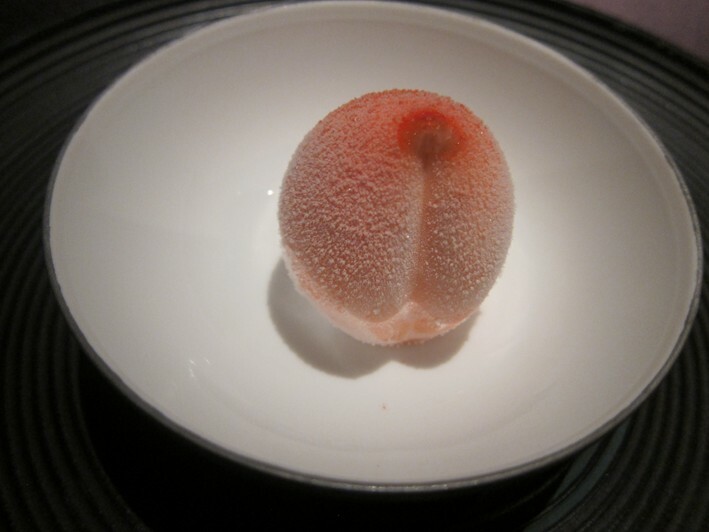 The first was candied Japanese peach, which had been frozen in liquid nitrogen to -196 degrees. As the peach sphere was cut open, warmed peach was poured over the frozen, giving a contrast of texture and temperature. For me the key here was not the technical trickery but the flavour of the peach, which was very good indeed, though not even the very finest Japanese peach I have eaten (18/20). 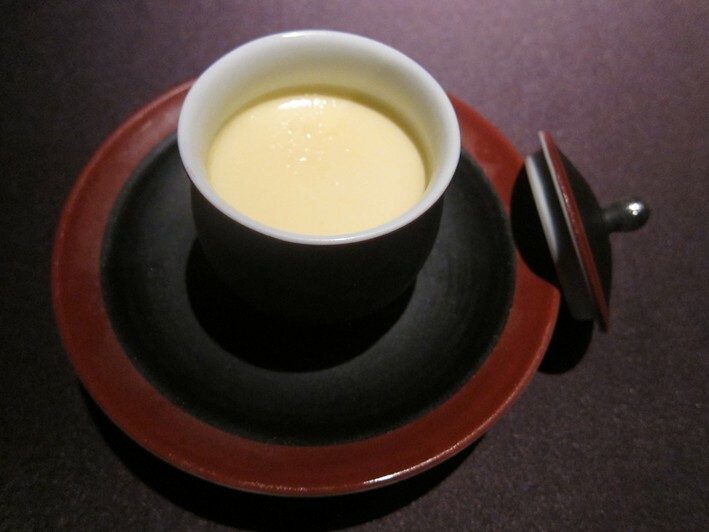 Ryugin in Tokyo has become known for this dessert, which may be made using strawberry rather than peach depending in the season. This was followed by "Roppongi pudding", a sort of creme caramel made with steamed egg, coconut powder and caramel sauce. This may sound like a humble dish, but the taste was stunning, the texture of the creme caramel dazzlingly light, the caramel sauce intense, the coconut usefully imparting lightness amongst the rich flavour. This was cooking of the highest quality (20/20). Service was a somewhat mixed affair. We encountered two waiters, one from Hong Kong and a lady from Tokyo. The waiter was pleasant but seemed to know little of the dishes beyond the bare description on the menu, whereas the Japanese waitress had a deep knowledge of the ingredients and cooking techniques used. 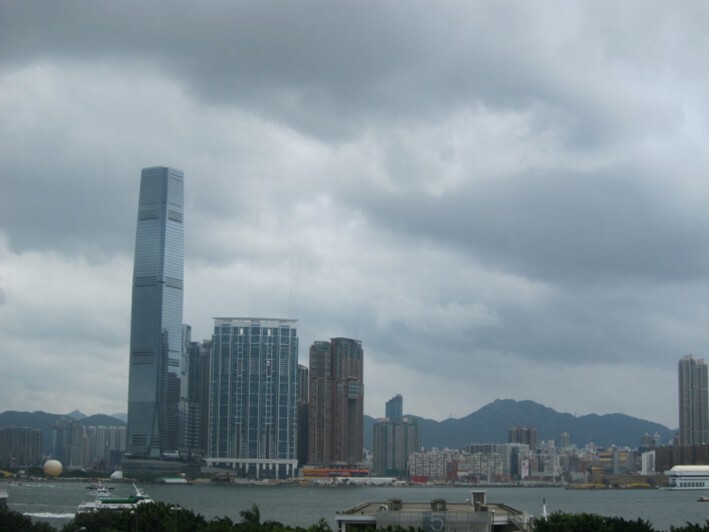 The bill, with beer, came to HK$2,327 (£192) per person. I was not sure whether it would be possible for the kitchen here to reproduce the magic of Ryugin in Tokyo, but I need not have worried. 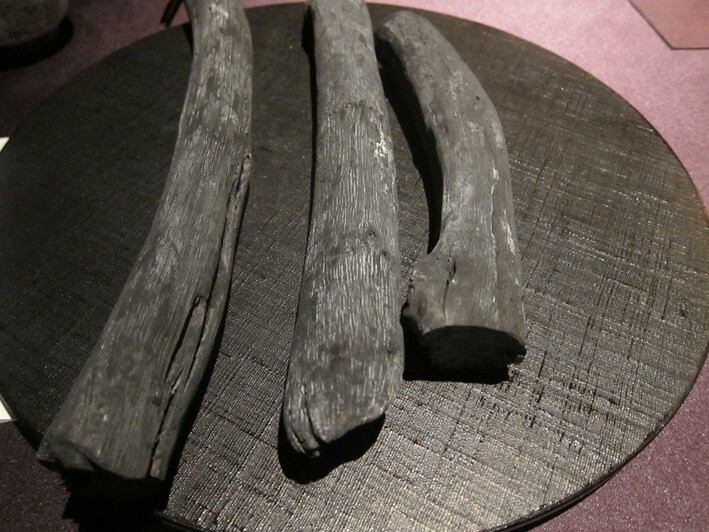 The same blend of stunning ingredient quality, faultless technique and occasional innovation have been transported from Roppongi to Kowloon. If you are in Hong Kong I highly recommend that you try Ryugin, which really is modern Japanese cooking of the highest quality.